The most effective way to keep your pool in tip-top shape is by using the right tools. And there’s no tool more important than your pool vacuum. A good pool vacuum is an investment, but one that you’ll reap the reward from every time you use it. Since there are so many pool vacuum models on the market, it’s important to understand which one will work best for you. First decide if you want a manual or an automatic pool vacuum. Manual pool vacuums are much less expensive than automatic ones, but they require a lot more effort on your part. Automatic pool cleaners are like robots that clean your pool all on their own. 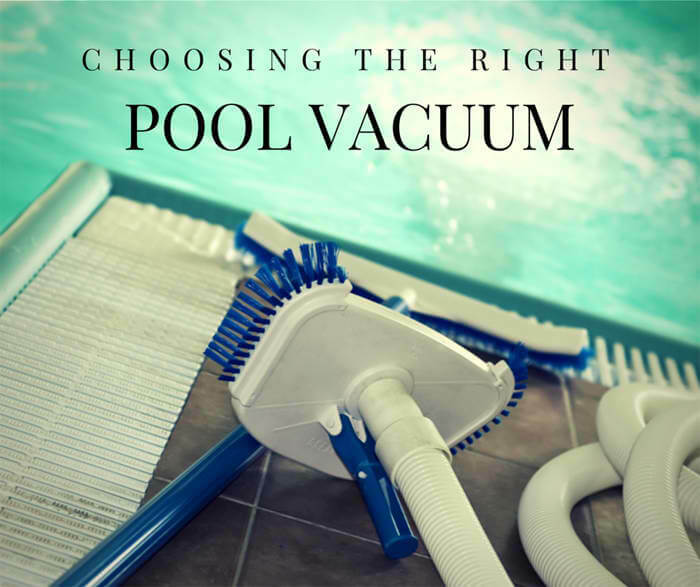 If a manual pool vacuum is for you, it’s important to choose the right kind of vacuum head. Depending on your pool’s surface, you may need a head with many attachments or one that’s weighted. Weighted vacuum heads help clean deeper pools more effectively as buoyancy can be a problem. Flexible heads allow you to clean better, as they are best suited for corners, steps and ladders. There are three types of automatic pool cleaners— pressure side, suction side and robotic – and each works differently. These cleaners function from water pressure coming from either your main circulation pump or a dedicated booster pump. The pressure forces the pump to move around the pool and pick up debris into the attached bag. These cleaners rely on suction to move around the pool and vacuum debris off the pool floor. These cleaners also have the ability to scrub the walls, reducing the time you would normally spend brushing them. These cleaners rely on the electronic motors inside the unit to power the cleaner so it can vacuum debris into its own filter through a separate pump. It also cleans both walls and tile lines.